The reason I love this bowl so much is that I’m able to pack it with many different ingredients you normally wouldn’t find in a maki roll, such as sweet & spicy oyster mushrooms, edamame and sugar snaps. It also helped me to eat more mindful, which in the end satisfied me more than stuffing my face with delicious maki. It’s also easy to bring for lunch and quick to prep, what else could you wish for? 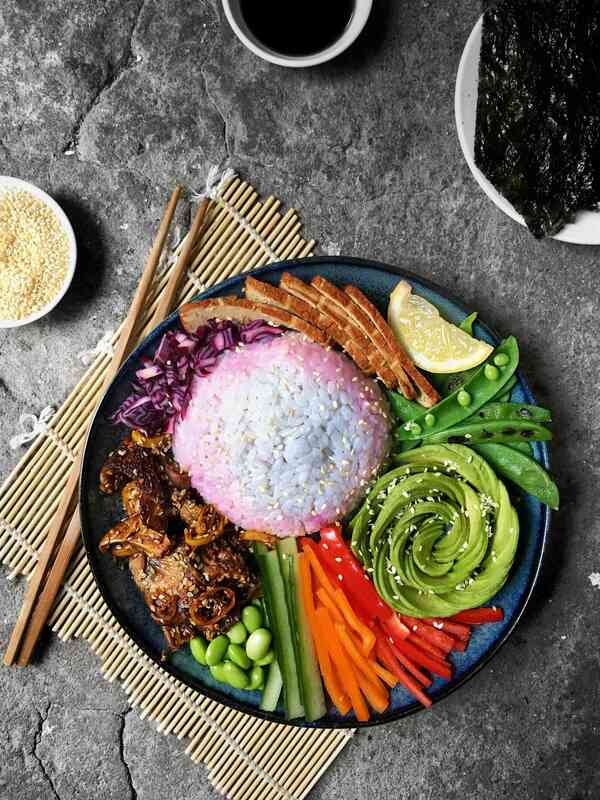 Oh maybe Unicorn rice? 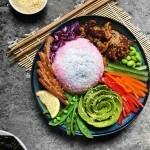 You can easily cut down on time and make it quicker by using plain white rice, or you can go the extra mile and add some magical colour to the rice, that with some acidity turns from lilac/blue to a hot pink. For this batch I used a less concentrated broth to create a more faded look, find details on how to make this rice over here. 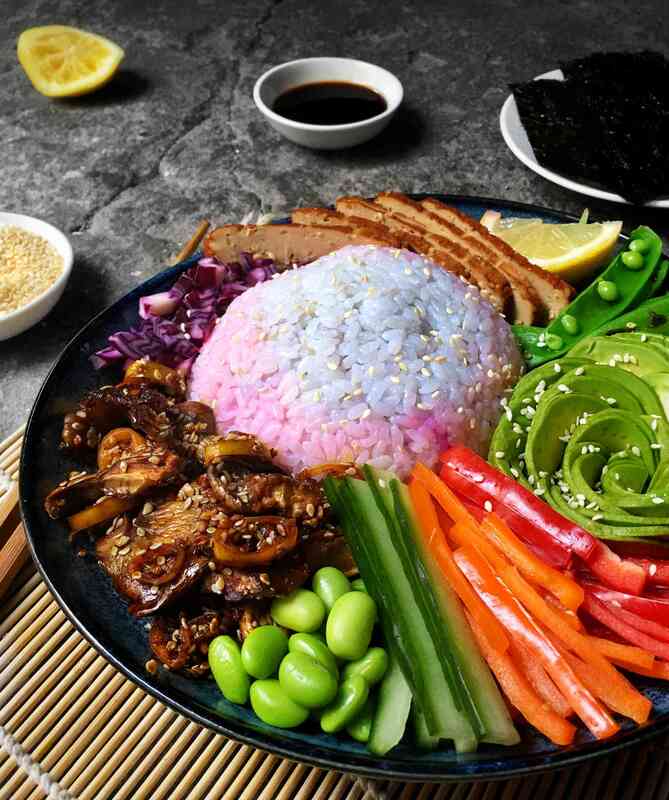 Like many of my other recipes you can easily modify this one to your own taste, maybe you hate mushrooms, but want to make a marinaded tofu, thats fine. You could also add some carrots to the dish or maybe even drizzle it with some vegan wasabi mayo, go nuts! I chose to add some edamame for some extra protein and I simple love them, smoked tofu because it’s pure deliciousness and sweet & spicy mushrooms. Feel like having sushi but don't feel like rolling? Well I've got something even better for you! Start by cooking the short grain (sushi) rice and making the oyster mushrooms. After these are made you can cut the remaining ingredients and optionally roast the sugar snaps and sesame seeds. 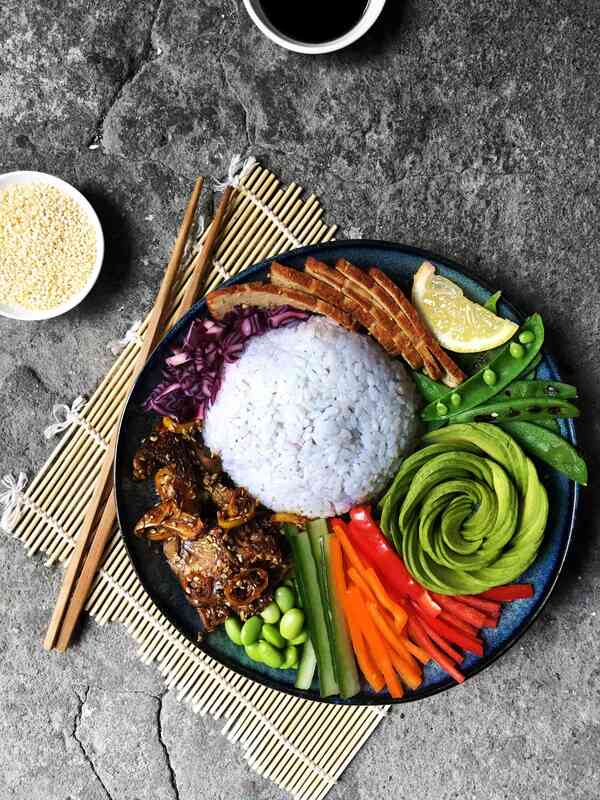 Now assemble the bowl the way you prefer, you can add more or less of your favourite ingredients. I had some nori, soy sauce and wasabi on the side. Enjoy! Start by sautéing the oyster mushrooms over a medium/low heat until they get golden brown, this will take about five minutes. Now add the remaining ingredients and cook for another minute. Additionally sprinkle with some spring onions when serving. Enjoy!